Lightning comes from charges that build up within a storm cloud. Thunderstorms form when warm, moist air rises high into the atmosphere. This upward wind is called an updraft. As air rises in the atmosphere, moisture in the air condenses into various types of precipitation. In a thunderstorm cloud, this condensation becomes either snow pellets or ice crystals. The snow pellets tend to fall toward the ground. Ice crystals are lighter, so the updraft carries them up toward the top of the storm cloud. As the ice crystals rise and the snow pellets fall, they often collide. When this happens, electrons are stripped off the ice crystals. The collision leaves the ice crystals with a positive charge and the snow pellets with a negative charge. The negative charge in the lower part of the storm also causes a positive charge to form on the ground. When opposite charges become strong enough, there is an electrical discharge—an energy release—in the form of lightning…ZAP! Lightning travels from an area of negative charge to an area of positive charge. 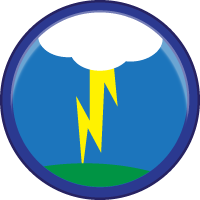 The lightning can go from negative charges in the cloud to the positive charges on the ground. This is called cloud-to-ground lightning. Lightning can also go between the negative and positive charges within the clouds, known as intra-cloud lightning. In this game, use your power as an updraft to separate the positive and negative charges to create some lighting of your own! You are an updraft. Use your cursor—and your windy powers within the cloud—to juggle snow pellets and make lightning! In the middle part of the storm cloud (the top dotted line) precipitation becomes either negatively-charged snow pellets or positively-charged ice crystals. The positively-charged ice crystals float to the top of the cloud. The negatively-charged snow pellets will fall toward the ground. Once the snow pellets fall past the melting line—the bottom dotted line—the snow pellets melt into rain. As you get more and more negatively-charged snow pellets, you'll see positive charges appear on the ground. Keep the negatively-charged snow pellets between the dotted lines! Click them as they fall so the updraft keeps them above the melting level. Lightning is produced between positive and negative charges. You can create cloud-to-ground lightning by clicking the cloud-to-ground lightning button once you have negative charge in the cloud and positive charge on the ground. You can create intra-cloud lightning by clicking the intra-cloud lightning button once you have positive charge in the upper part of the storm and negative charge in the lower part of the storm. 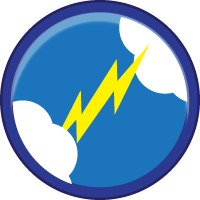 Intra-cloud lightning will earn you more points, but it's a little harder to pull off! You'll also get a multiplier for the amount of charges involved.